This isn’t the first comparison I would make, but it looks like enough other people are doing so. On Twitter in Japan, people are comparing similar poses in Idolmaster: Cinderella Girls and Magic the Gathering. 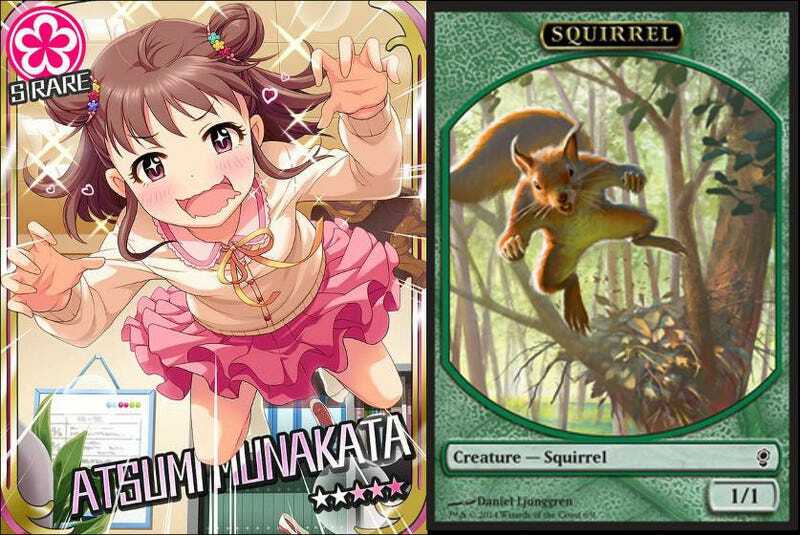 As noted on Togetter, there’s even a hashtag for the comparisons: #モバマスの画像をアップすると近い構図のmtgのカードが送られてくる (loosely, “If I/you upload a mobile Idolmaster game image, then then I/you can get a Magic The Gathering card with a similar composition”). While the kwinky-dink images are hardly exact matches, some are close enough to be similar—and humorous. The amazing thing is that people were able to find these corresponding cards!